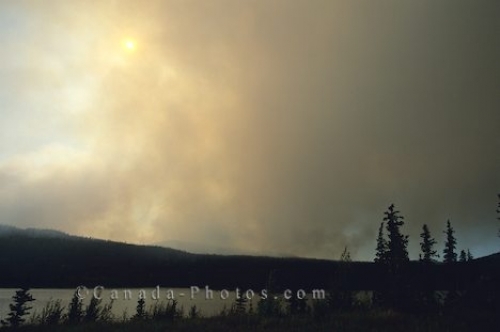 Smoke from a forest fire is a sight that is fairly common in the Yukon Territory in Canada. Billowing smoke fills the sky from a forest fire that burns behind the hills near Whitehorse in the Yukon Territory of Canada. The smoke from this forest fire could hang around the Yukon for days, weeks or months depending on the extremity of the forest fire. Picture of thick smoke above the hills from a raging forest fire in the Yukon Territories in Canada.